AIIMS Notification is out. AIIMS is recruiting for 110 Various Post Govt Job Posts. 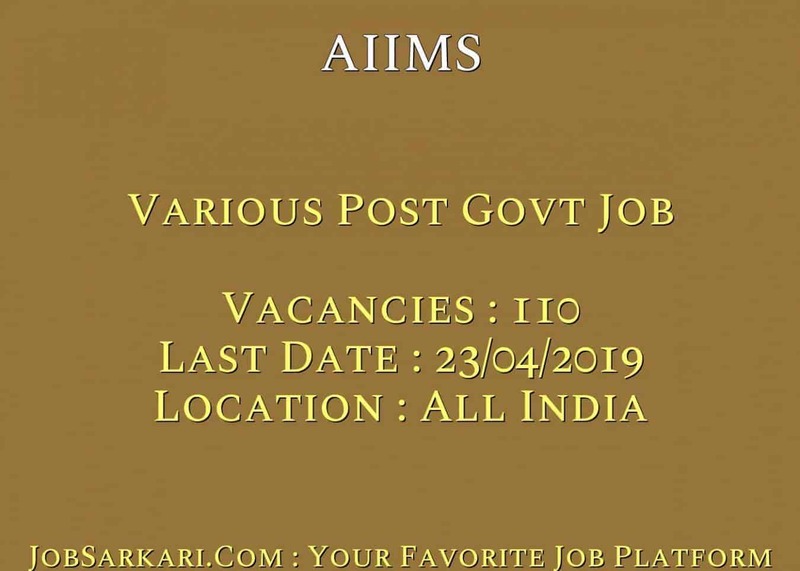 You can check AIIMS - All India Institute of Medical Science last date, download AIIMS notification, visit AIIMS official website and check other AIIMS Vacancy details.Complete Vacancy and recruitment Details about 110 Various Post Govt Job vacancies in AIIMS are provided below by JobSarkari.Com only for you. Last Date of Apply Online. 23/04/2019. Mode of Payment. Candidate Need to Pay Fee Through Online Mode Via Payment gateway of AIIMS Jodhpur. Yoga Instructor. 01. 00. 00. 00. 00. 01. Assistant Engineer (Air Conditioning & Refrigeration). 01. 00. 00. 00. 00. 01. Assistant Engineer (Civil). 02. 00. 00. 00. 00. 02. Assistant Engineer (Electrical). 01. 00. 00. 00. 00. 01. Junior Engineer (Air Conditioning & Refrigeration). 03. 01. 00. 00. 00. 04. Junior Engineer (Civil). 05. 01. 00. 00. 00. 06. Junior Engineer (Electrical). 02. 00. 00. 00. 00. 02. PACS Administrator (Technical Officer Photography). 01. 00. 00. 00. 00. 01. Maternity and Child Welfare Officer. 01. 00. 00. 00. 00. 01. Electrocardiograph Technical Assistant. 01. 00. 00. 00. 00. 01. Health Educator (Social Psychologist). 01. 00. 00. 00. 00. 01. Medical Record Officer. 03. 01. 00. 00. 00. 04. Office Assistant (NS). 06. 07. 02. 01. 02. 18. Private Secretary. 04. 01. 00. 00. 00. 05. Personal Assistant. 05. 01. 00. 01. 00. 07. Assistant Store Officer. 01. 00. 00. 00. 00. 01. Medical Record Technician. 10. 05. 01. 03. 01. 20. Stenographer. 16. 09. 03. 04. 02. 34. Total Vacancy. 64. 26. 06. 09. 05. 110. Yoga Instructor. Candidate Must Have Passed Graduation With Diploma in Yoga. Having Graduate in Yoga Science and 5 Years Experience in Related Field. Min 21 And Max 35 Years. Assistant Engineer (Air Conditioning & Refrigeration). Candidate Must Have Passed Graduation in Mechanical/ Electrical Engineering With 5 Years Experience in Related Field. Max 35 Years. Assistant Engineer (Civil). Candidate Must Have Passed Graduation in Civil Engineering With 5 Years Experience in Related Field. Max 35 Years. Assistant Engineer (Electrical). Candidate Must Have Passed Graduation in Electrical Engineering With 5 Years Experience in Related Field. Max 35 Years. Junior Engineer (Air Conditioning & Refrigeration). Candidate Must Have Passed Graduation in Electrical/ Mechanical Engineering As Mentioned in Notification. Max 30 Years. Junior Engineer (Civil). Candidate Must Have Passed Graduation in Civil Engineering As Mentioned in Notification. Max 30 Years. Junior Engineer (Electrical). Candidate Must Have Passed Graduation in Electrical Engineering As Mentioned in Notification. Max 30 Years. PACS Administrator (Technical Officer Photography). Candidate Must Have Passed BE/ B.Tech/ MCA With 2 Years Experience in Medical IT System/ PACS. Min 21 And Max 35 Years. Maternity and Child Welfare Officer. Candidate Must Have Passed Degree or Diploma in General Nursing And Midwifery And 1/2 Years Experience in Related Field. Min 21 And Max 35 Years. Electrocardiograph Technical Assistant. Candidate Must Have Passed Class 12th in Science With Certificate/ Diploma Course in Electrocardiography. Min 21 And Max 30 Years. Health Educator (Social Psychologist). Candidate Must Have Passed MA/ M.Sc Degree in Psychology and 5 Years Experience in Related Field. Min 21 And Max 35 Years. Medical Record Officer. Candidate Must Have Passed Bachelor Degree Preferable With Science And Having 1 Year Course in Medical Record With 5 Years Experience in Related Field. Min 21 And Max 35 Years. Office Assistant (NS). Candidate Must Have Passed Graduation And Having Proficiency in Computer. Min 21 And Max 30 Years. Private Secretary. Candidate Must Have Passed Degree And Having Dictation 120 WPM in 7 Mins And Transcription 45 Mins in English or 60 Mins in Hindi on Computer. Min 18 And Max 30 Years. Personal Assistant. Candidate Must Have Passed Degree And Having Dictation 100 WPM in 10 Mins And Transcription 40 Mins in English or 55 Mins in Hindi on Computer. Min 18 And Max 30 Years. Assistant Store Officer. Candidate Must Have Passed Degree And Having Post Graduation Degree/ Diploma in Material Management. Having Bachelor Degree in Material Management. Min 18 And Max 35 Years. Medical Record Technician. Candidate Must Have Passed B.Sc in Medical Records. Having Class 12th in Science With 6 Months Diploma/ Certificate Course in Medical Record And 2 Years Experience in Related Field. Min 18 And Max 30 Years. Stenographer. Candidate Must Have Passed Class 12th And Having Dictation 80 WPM in 10 Mins And Transcription 50 Mins in English or 65 Mins in Hindi on Computer. Min 18 And Max 27 Years. 3. Candidate Need to Register Themselves Already Registered Candidate No Need to Register Again. 4. After Registration System Will Generate Log In ID And Password . Candidate Need to use it For Log In. 5. Candidate Need to Fill All the Details in Application Form And Need to Upload All Mandatory Documents As Prescribed Size And Format. 6. Candidate Need to Apply Online on Or Before 23rd April 2019. Q. What is the Last Date For AIIMS Various Post Govt Job Vacancy ? A. 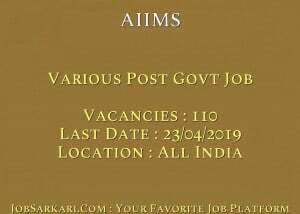 Last Date for AIIMS Various Post Govt Job Posts is 23/04/2019. Q. What is the Form Type of AIIMS Various Post Govt Job Recruitment ? A. The Form Type for AIIMS Various Post Govt Job Posts is Online. Q. How many vacancies are available in All India Institute of Medical Science Various Post Govt Job Posts ? A. There are about 100 Vacancies in All India Institute of Medical Science Various Post Govt Job Posts. Q. What is the Full Form of AIIMS ? A. Full Form of AIIMS is All India Institute of Medical Science . Aap is Link Se Sabhi Govt Jobs ke Liye Apply Kr Sakte Hain..